As your general and family dentist, Dr. Jorgenson and his team at Advanced Dental Care in Costa Mesa are fully committed to protecting your family's smiles. Of course, the cornerstone of that protection is a dental checkup. But beyond these twice-yearly appointments, there is much more we can do to protect your teeth. 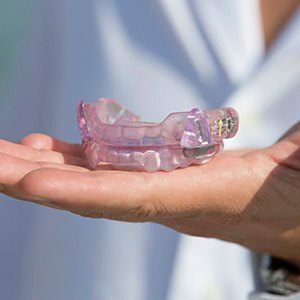 Nightguards and custom-made athletic mouthguards are two oral appliances that you or any member of your family can use daily if necessary to shield your teeth from harm or damage. In fact, using these can make our finding problems during a checkup less likely. 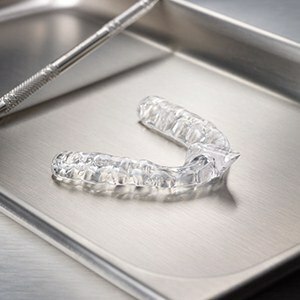 Why Choose Advanced Dental Care for Nightguards & Mouthguards? Do you occasionally hear a sound during the night that reminds you of fingernails on a chalkboard? Or do you regularly wake up with dental soreness, jaw tightness, or headaches? If the answer to either of these questions is yes, then chances are there is someone in your home who grinds their teeth at night. This nocturnal habit can affect children, teens, and adults. Often related to stress, teeth grinding can be a symptom of TMJ dysfunction. Your temporomandibular joints are located on either side of your face just in front of your ears; they allow you to open and close your lower (mandibular) jaw when you speak, eat, smile, laugh, or yawn. If the muscles or nerves associated with these joints do not operate properly, then symptoms including pain, swelling, headaches, and teeth grinding may ensue. Dr. Jorgenson can prescribe a customized oral appliance called a nightguard. This comfortable appliance made of smooth plastic prevents teeth grinding and clenching while you sleep. Thus, a nightguard preserves the health and structure of your teeth. Whether your sports enthusiast is young or old, an athletic mouthguard is an essential piece of equipment. This custom-made oral appliance protects teeth, lips, gums, and the tongue during athletic play and practice. Moreover, recent research indicates that wearing a mouthguard may also reduce the incidence and severity of a concussion! Basically, a mouthguard acts like a shock absorber, reducing the impact of a blow to the face and head. And if the mouthguard is for your daughter or son, then we’d like to show some school spirit too! We can have their mouthguards fabricated in school colors. So, whether the athletic mouthguard is for one of the kids or your weekend warrior, talk to Dr. Jorgenson about the dental health benefits of wearing this important oral appliance. Call our Costa Mesa dental office to reserve an appointment with Dr. Jorgenson. We are happy to serve patients from Irvine, Newport Beach, Huntington Beach, and beyond.